FOR ENDURING PERFORMANCE AT THE CORE, IT PAYS TO START WITH A SUPERIOR PRODUCT. With 60 years’ experience in the composites industry, General Plastics understands the exacting standards of OEMs and the importance of rigorous quality assurance. 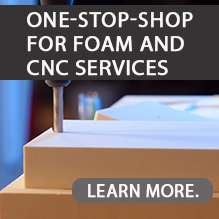 When you select our rigid closed-cell foam products to serve as composite core material, know that they will conform to your specifications at delivery and over time. We also offer fast turnaround and scalability to meet your OEM production requirements. Not all foams are created equal. Are the polyurethane foams you’re considering reliably constant from sheet to sheet, batch to batch, and within each block? Are they easily finished with nearly any resin, paint or coating system? Will they repel water? Bond securely? Prevent the release of toxic fumes or chemical compounds? Do they remain strong, flat and stable – and retain their stated CTE rating – 10 years later? If a lower-priced foam warps, expands, degrades or resists bonding, it’s far more costly in the long run. Get more for your money by using a superior product in the first place. General Plastics’ anti-static composite foams offer a smooth, grain-free cell structure. The tough material machines beautifully and cuts crisply. These foams retain their strength, dimensional stability and chemical properties for years to come. And, they are free of CFCs and VOCs. Our unique formulations offer a compelling alternative to traditional core materials, such as thermoplastic foam, honeycomb, wood and metal. LAST-A-FOAM® composite core materials have been used for years in the aerospace and automotive industries in place of aluminum, as well as for sports equipment. In the marine industry, General Plastics composite core foams provide a non-decaying alternative to wood that supports fiberglass laminating production processes. From the impact resistance required for a hockey stick blade to the durability of a wing tip, General Plastics’ LAST-A-FOAM® offers high-strength, low-weight solutions for diverse manufacturing processes. Whether you need board stock or machined parts, we can meet your exacting specifications. Read this post to learn how General Plastics featured its’ composite core materials for light-weighting applications at JEC World 2018 in Paris, France.